In a recent trip to my local grocery store I was pleasantly surprised to find something OTHER than the basic Rose’s Lime Juice in the mixers isle. All thoughts stopped as I was drawn to find not only a natural sweetened lime juice but also a “real” grenadine as well. I decided it would be worth a side by side tasting and comparison of the basic standard of Rose’s with this new item on the shelf by “Powell & Mahoney.” I’ve based this review off of 5 main criteria: Recipe/Ingredients, Color, Aroma, Taste, and Overall. To begin Rose’s Sweetened Lime Juice is based on Corn Syrup as it’s main sweetener and is colored artificially to give a strange green chartreuse color. The P&M’s color however is a refreshing amber color that already seems better by comparison. It’s ingredients are also 100% natural so instead of corn syrup, food coloring, and concentrated lime juice as the core components, you’re looking at filtered water, and cane sugar in addition to the same lime juice concentrate. Rose’s Lime has a sweet and limey aroma that lends itself to something of a lime peel. 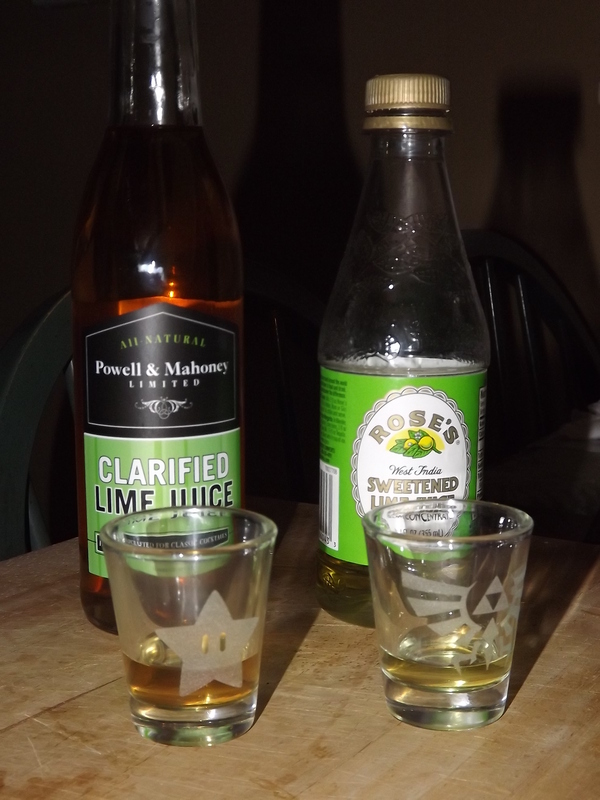 The P&M lime juice smells less sweet and a bit more like apple juice (which is strange as it doesn’t contain any). The taste of the Rose’s Lime should be familar to any mixologist. It’s very sour with some sweet undertones as the juice crosses your palette and settles down. The Powell & Mahoney Clarified Lime Juice however, has a far superior taste in my opinion. It’s less sour and has a wonderfully juicy taste like you just bit into a sugared lime wedge. So between the two of them I’ll highly recommend some Powell & Mahoney Clarified Lime Juice (over Rose’s) for most drinks. While Rose’s is a nice color component and heavy on the sour which could be great for a modern cocktail, the P&M gives a classic taste to any drink. I imagine it would go great in a Gin or Rum based drink especially a Gimlet or a Daiquiri Variation. If you have some in your area, I recommend picking some up! While B&B might be found in any liquor store, Benedictine is a bit harder to come by depending on where you live. Last year I was lucky enough to track down a bottle of it and have it stocked in my bar ever since. 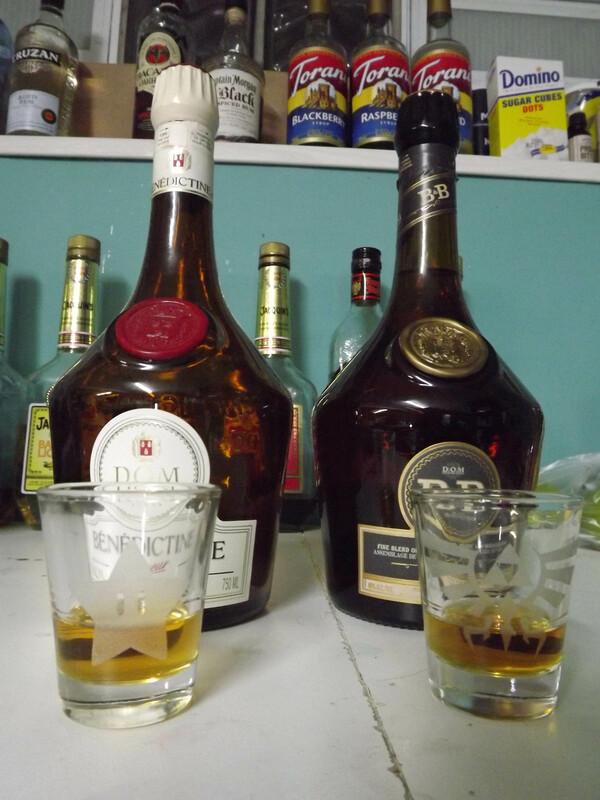 However, I have since decided to make the switch to B&B (Brandy and Benedictine) as it is more readily available at most stores. So to finish the remaining portion (about 1/3 oz) of my Benedictine I decided to do a side by side taste comparison for you my fellow mixologists. To begin both are amber colored liqueurs that are priced between $30 and $40. They’re also earthy and herbal with a strong aroma to match. Ok so let’s start with the one we should already be familiar with here on the blog. Benedictine, has the consistency of a modern blue curacao or dark rum with a slightly thicker consistency than a standard spirit. While technically classified as a liqueur, Benedictine has the full body and kick of a standard spirit. “Clocking in” at 40% ABV (80 Proof), it doesn’t overpower itself with either sweetness or alcohol burn. The liqueur starts very sweet and then moves to a complex earthy (almost green earthy) flavor and rounds out with a little bite on the finish to remind you that it is still alcohol. Like B&B it’s not often mixed with to many other ingredients and is preferred by most sipped over ice. B&B surprised me by being slightly darker in color than the traditional Benedictine. While the aroma of Benedictine is sweet and herbal, the B&B has much more of a classy brandy aroma. You might even pick up a little oak in that smell as well. B&B starts off sweet like it’s predecessor, however the mid palette is where everything changes. The herbal quality is very subtle and if you weren’t looking for it you might just miss it. The after taste is much cleaner and it leans very much to the fine French Brandy that is contains. Being a mixed liqueur it is also on the thinner side of the viscosity spectrum and feels a bit lighter in the glass. I certainly wasn’t expecting such a distinct difference in flavor for this particular mix. While it is similar in color B&B is a very different liqueur which will both allow me to try new recipes but also be cautious in substituting it for Benedictine in the future. At the same 40% ABV, you certainly feel more of the kick when drinking it, but that’s not necessarily a bad thing. Between the two of them I will continue to recommend Benedictine, however if B&B is all your can find I believe it will suffice for a mixed drink just fine. Just don’t give one of them to someone on ice and try to convince them it’s the other.